After growing cymbidiums for a few years, many new growers are ready to try something different. My recommendation is to try species orchids, which, for the uninitiated, are orchids that grow (or grew) wild somewhere in the world. Don’t fear that any orchid that you acquire will be ripped out of some foreign jungle. They may have been once, but all of the species that I recommend will be available as divisions of plants long since collected, or as seedlings raised from those plants. 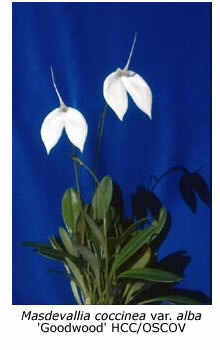 One of the advantages of a collection of species orchids is that it will provide you with flowers throughout the year. At the time of writing, I have species belonging to eight different genera in flower, and this is not an unusual occurrence. I like to find out where my species grow in nature, and when they were first described and collected. 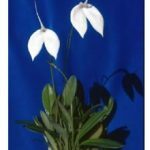 If you can find where they live in nature and then determine the climatic conditions there, it provides the opportunity for you to grow your orchids to their best potential. 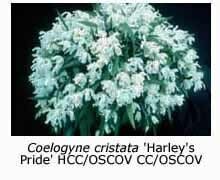 The following species orchids can all be grown and flowered in Melbourne in an unheated shadehouse, preferably one with a fibre-glass roof. Alternatively, you can fit plastic sheeting over the roof in winter to keep the plants from becoming too wet. Plastic sheeting should also be erected in winter to block cold winds from the west and south. 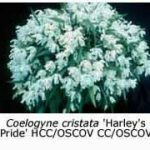 Most of the orchids listed come from areas nearer than Melbourne to the equator, where the summers are warm and wet, and the winters are relatively cool and dry. These orchids will need frequent watering in summer, but much less water in winter.